LAKA: Tame, domesticated, gentle…attracted to, fond of; to tame, attract (Puku`i & Elbert, Hawaiian Dictionary p. 191). Laka, hula`s divine patroness, personifies the qualities necessary for mastery of hula: training of the untamed body, mind and spirit. She lives in the forest, which for Hawaiians was a wild, dangerous and frightening place. Every successful student of hula passes from a wild, undisciplined state to one of spiritual and physical poise. Often this passage is metaphorically represented as a journey from the forest’s chaos into the ordered space of the hālau hula. Significantly, this journey always begins in the forest. Laka redirects wild energy; she does not annihilate it. This process is hardly unique to hula or to Hawaiian thought. 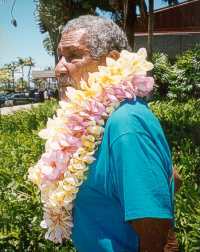 Indeed, in other phases of Hawaiian and Polynesian culture it bears the names La`a, Rata, Lata etc. These ideas and personages who embody them have in common the concepts of discipline and equilibrium. Through stories and proverbs Laka etc. teach the importance of balance between male and female, the individual and the community, human beings and the world they inhabit. For a variety of reasons, these tales often describe voyages. One obvious reason is that Hawaiians and their fellow Polynesians are quintessential voyagers. Glance at a map of the Pacific, and you will see one third of the earth’s surface; most of it is water. Flung like an handful of gravel across this water lie islands, most of them small, rugged, and poor in resources. Many lack fresh water or arable soil. 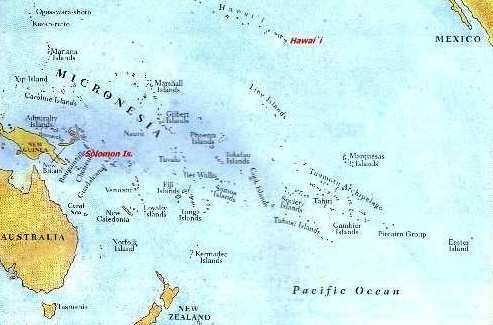 Yet in such hostile spots, Polynesians built a rich culture long before Europeans ventured across the region. To do this they developed sciences of navigation, marine technology and colonization. They developed qualities of adaptability, restraint, endurance, fortitude and aloha essential for survival during the long and often perilous processes of discovery and settlement. These techniques and values they recorded and taught in stories about people who went voyaging. One of them was Laka, the tame one, or the one who attracts and tames. 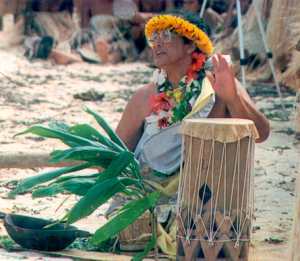 The discipline and equilibrium which s/he represents being essential to voyaging as well as to dance, it is hardly surprising that s/he appears in Hawai`i as a dancer, a keeper of winds, the navigator who brought the pahu hula (hula drum) from Tahiti, etc. In New Zealand, Rata is both a tree and a canoe builder who cuts down trees. 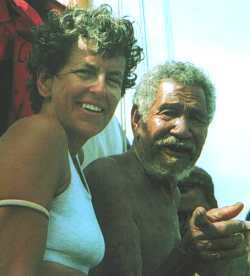 In the Polynesian enclaves of the Solomon Islands, Lata the canoe builder and navigator is the direct lineal ancestor of the Paramount Chief and Navigator of Taumako. Since the jet plane has replaced the sailing canoe as a vehicle for trans-Pacific travel, many, perhaps most of the region’s people have forgotten the old seafaring skills, and, perhaps more significantly, the spiritual discipline undergirding them. In remote areas like Taumako Island, however, some people like Lata’s heir, Paramount Chief Koloso Kaveia, have kept these traditions alive. More important for our purposes, he and his people want to share their knowledge with anyone willing to learn the way of Lata. As a teacher of traditional Hawaiian culture, our President, Roselle Bailey, sails a parallel course. Recognizing this, Chief Koloso invited her to come to Taumako in September 1997 to perform a Hawaiian blessing for the voyaging canoe Vaka Taumako, which his people built in 1996-7 as part of their effort to teach the next generation of Lata`s grandchildren their ancestral ways. She found Taumako to be “like going back to the time of Captain Cook”, Polynesians living without the “conveniences” – and distractions – of modern life. “It was wonderful,” she said. Since her visit to Taumako, she has become a director of the Pacific Traditions Society, the 501(c)3 organization that supports the Vaka Taumako Project, Chief Koloso’s name for his endeavor. She has also lectured on the project, and narrated its first educational video, The Heirs of Lata. If you want to learn more about the Vaka Taumako Project, visit the project website at: www.vaka.org or contact its director, Vaka Taumako Project, P.O.Box 712, Captain Cook, HI, 96704.